Between us, Bonn and I have travelled enough to know what we’re doing when we go through an airport. Every since that first flight together, where we quickly navigated our way around the tourists at Luton and made a beeline for the bar, we’ve known we make good travel companions. It’s all about being organised when flying. 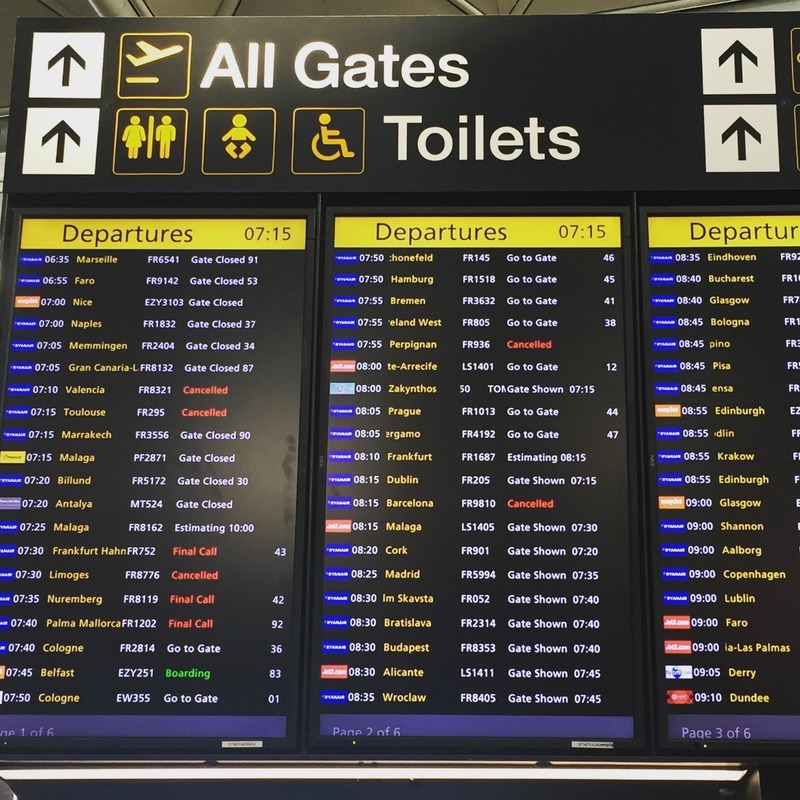 Airports seem to be designed to confuse travellers, especially those that don’t fly often. Most of the ones in the UK seem to have a layout designed around shopping rather than flying. You have to walk through wafts of perfume and aftershave and past duty free alcohol of all sorts before you get anywhere near your flight, or anywhere to sit whilst waiting for it. Duty free is probably the last obstacle though. The problem is often to the queues and process to get that far. As everyone knows, since 9/11 security at airports is tight. I totally get why that is, but what you need to do can be confusing if you’re not familiar with it. The key to getting to the air-side bar (or coffee shop) unscathed is being organised. Have all your paperwork in one place. Keep your tickets, passport and anything else you may need together. When I’m flying with an airline that doesn’t have electronic boarding cards I favour a travel wallet to keep everything in. Catching up with Snopake at the recent Blog On X in Manchester I was introduced to their Travel Holder which is a perfect solution. 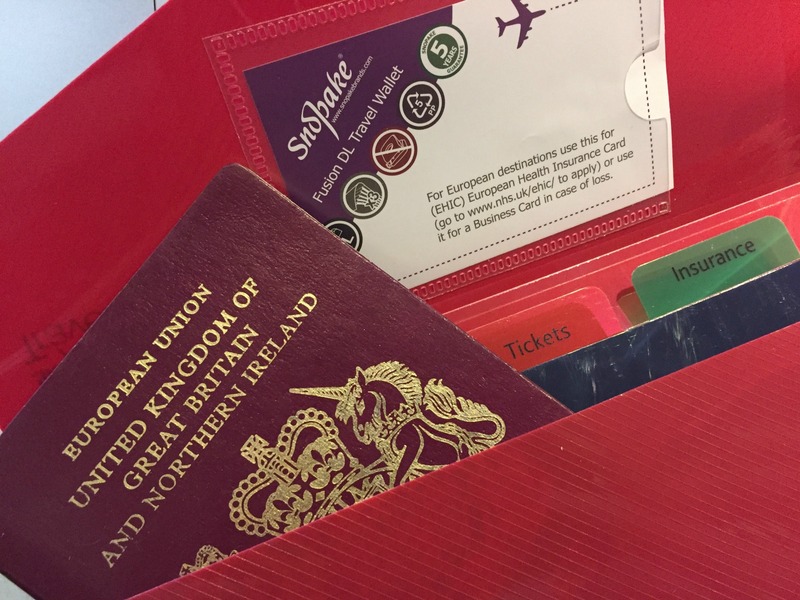 With separate sections for your passport, tickets and insurance documents it’s sturdy enough to be taken in and out my bag numerous times during a trip. There’s also a handy space inside to keep my EHIC, something that I’m always frightened of mislaying when I actually need it in Europe. Travel paperwork isn’t the only thing that you need to be organised about at an airport. Understanding the security rules is key to a smooth journey from check in to bar. Different airlines allow you different amounts of hand luggage, but the European Airline Security Rules are the same. When you go through security you need to put all bags through the X-ray machine. Along with coats, bulky jumpers etc, large shoes and belts, belts, some watches. Depending on what I’m wearing it can sometimes feel like I’m stripping in the security queue, but remember that everyone else has to do the same. When you put your bags into the tray they will ask you not to overfill it, and also to separate out your laptop or iPad, and also any liquids. Since November 2006 there is a restriction on the quantity of liquids that can be taken on board aircraft in hand luggage. 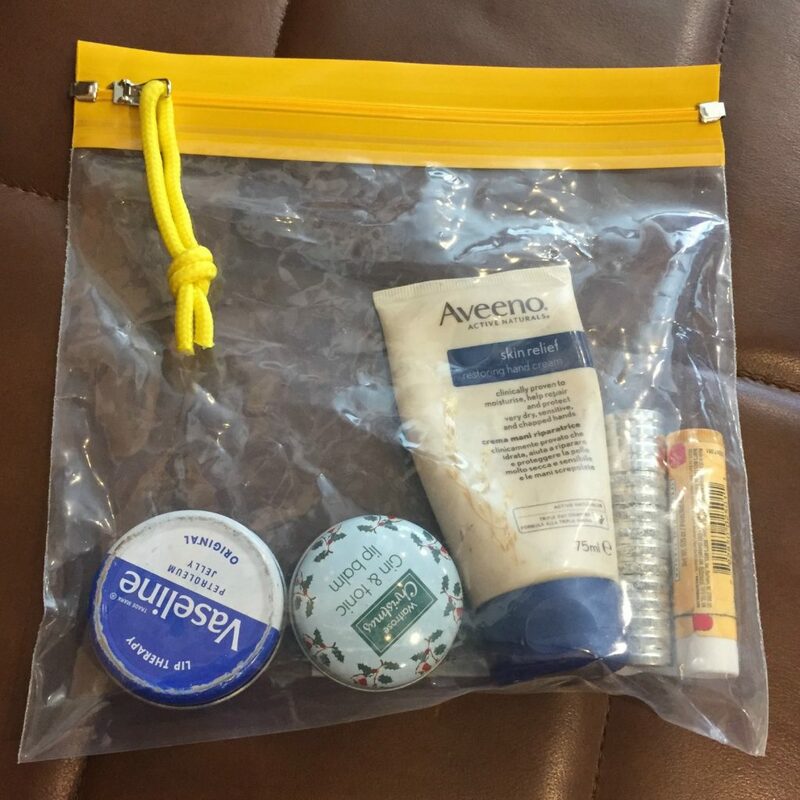 Each passenger is allowed one single, transparent, re-sealable plastic bag, which must not exceed 1 litre in capacity. That’s about 20cm x 20cm. Everything in that bag much be in separate containers and none of them must exceed 100ml in capacity. The bag must also be sealed. If you get as far as security with anything bigger than 100ml or anything that won’t fit in a bag of the specified size it will be binned. End of story. Most airports do have plastic bags available whilst you queue, but they’re usually flimsy ones that don’t last long. And you also end up delaying that trip to the bar whilst faffing around filling it! I always get my liquids ready in a plastic bag before heading to the airport. But, it was usually a small plastic supermarket food bag that ended up screwed up in a right mess in my handbag. Again, Snopake have come to the rescue with their Air Bag. This durable bag meets all the EU airport security rules and is perfect for when you fly. As I went through Stansted this morning I literally flew through compared to various women (and yes they were all women…) who had to pack and re-pack their plastic bags of toiletries! Just remember: Pack it right. Don’t miss your flight! 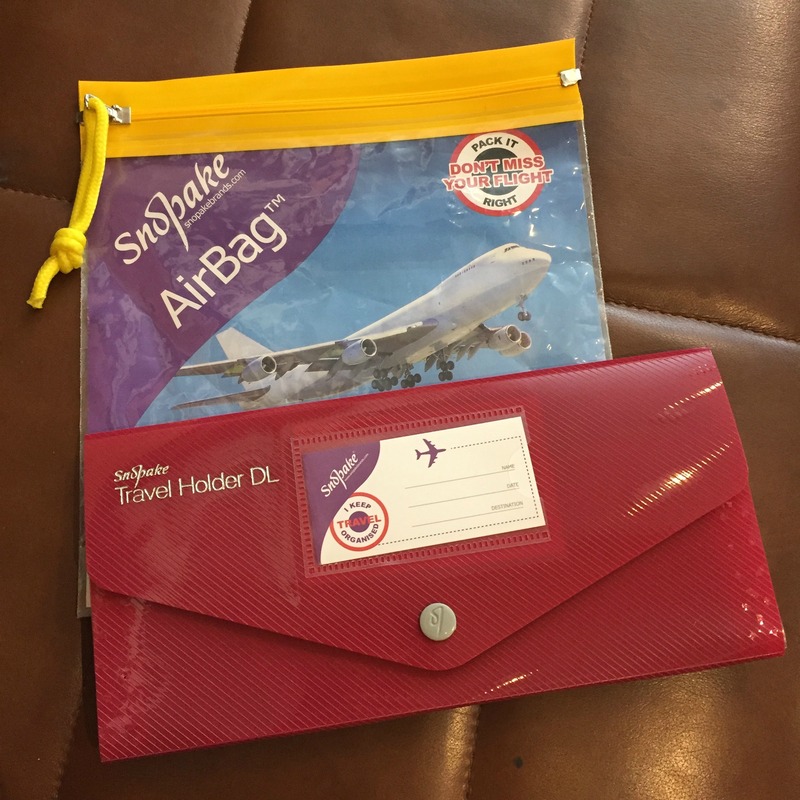 Disclaimer: Snopake gave me the Air Bag and Travel Holder featured in this post when I met them at Blog On X. There was no obligation to blog about them. All opinions remain my own. This post contains affiliate links. I was trying to work out the other day when it is you stop just “going on holiday” and instead start “travelling”. Is there really a difference? I mean, you can obviously travel out being on holiday, but can you holiday without travelling? When you’re a child you’re normally just taken on holiday, but I do know some lucky children who would describe themselves as going travelling. Strangely, for me, I think there was an obvious moment when I realised the difference. I was “on holiday” with my parents up on the west coast of Scotland. My Dad was off taking photos somewhere and being a typical stroppy teenager I stayed in the car. This being before mobile phones I picked up the Rough Guide (probably the one for the Scottish Highlands and Islands) and started leafing through it. I found myself in the section for Ullapool (a place I am now desperate to return to) and remember suddenly realising that I was reading listings for laundrettes and where you could get internet access locally (this dates the story). It was reading those listings that I suddenly had this lightbulb moment in which I realised that travelling was different to being on holiday. On holiday you tend to go where where you want to go and then come home again, bringing your dirty washing home with you. Travelling you look at places totally differently. You try and understand how the locals live. You don’t just go to the main tourist sites, but instead you try and get a feel of how the locals live. Years ago, I used to attend a series of European conferences for young engineers. At them we talked lots about the mobility of engineers across Europe and how we could better ourselves by travelling and understanding the different work cultures. One important lesson I was taught by a German delegate was that to properly travel somewhere you needed to work out how to take public transport and also find and eat the local fast food. When I first heard this I just laughed, but then the more I thought about it, the more I realised he was right. It’s now exactly what I try to do whenever I go somewhere new. It’s also not just about the destination, but the journey to get there. It’s no secret that I’m a huge fan of train travel, but I’ve also got a soft spot for ferries and any other slower mode of transport. Air travel is fine, but you don’t get to see as much from the air as you do when on land or sea. As a child I watched Michael Palin’s Around the World in 80 Days and I was hooked. Yes he want to some amazing destinations (and was the reason I was always so keen to visit Hong Kong) but it was so much more about the travel adventure to get around the world. The modes of transport, the routes they took and the people that he met during the journey. If I ever had a travel dream it would be to recreate that journey and share it online. It really would be the ultimate bit of travelling. 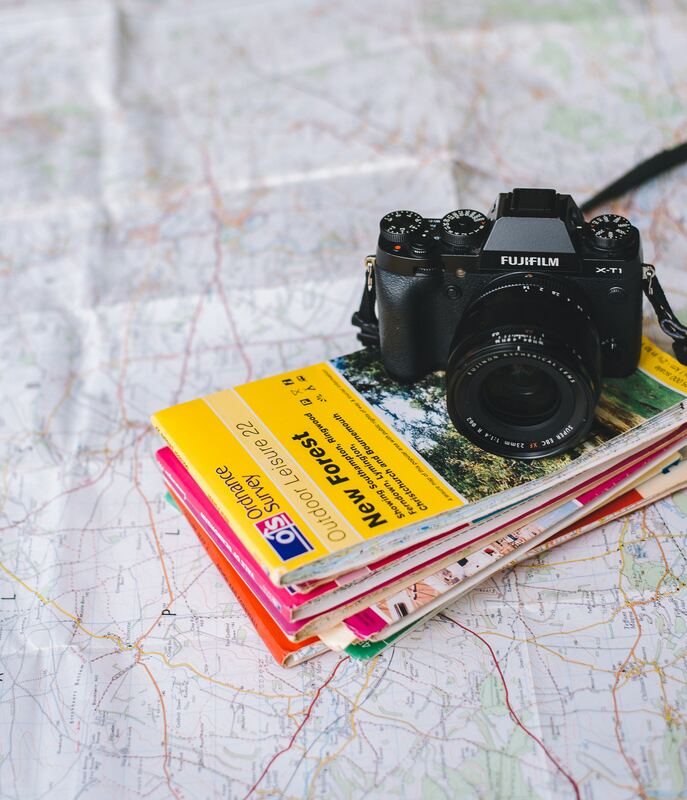 I might not be able to afford to take 80 days out to travel around the world, but I try to squeeze in as much travel as I can (both close to home and further away) and plan to share as much of it as possible. I hope you’ll join me for the journey.